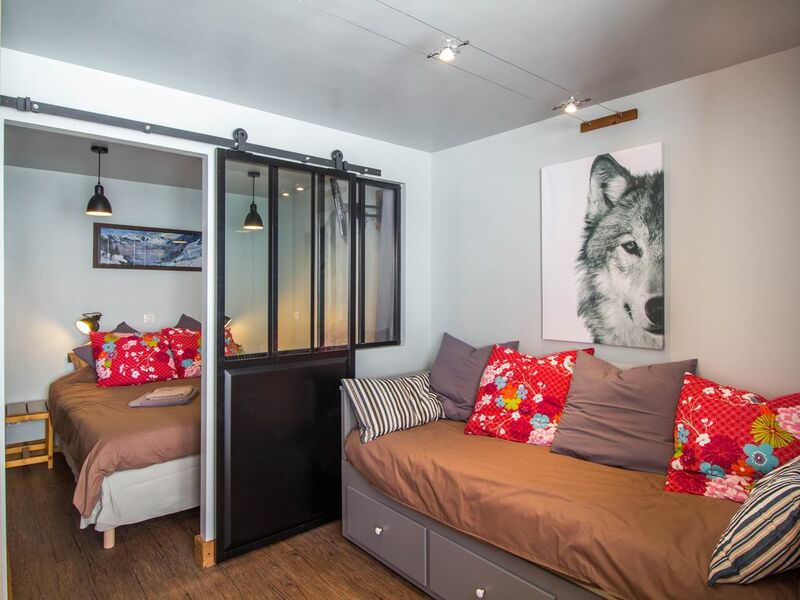 Newly created this year, the owner/renters Mark & Cathy Gardiner have designed and created this beautiful 8 bed, 2 bathroom ski in ski out apartment with direct access to the piste in Vallandry - Les Arcs - La Plagne Paradiski. Free wifi with Netflix, Washing machine/tumble dryer, Internet TV, en suite bathroom in the master bedroom with Italian shower. Private ski locker and large balcony giving direct access to the 425km of Paradiski pistes and limitless off piste. 150m from the nearest lift, ski school and equipment hire shop. washer and tumble dryer combined. one bath towel per person, a bath mat and a hand towel in each bathroom. Open plan kitchen, living/dining room. Two flatscreen internet ready smart LED televisions, one in the master en suite bedroom and one in the living room lounge. West facing balcony that opens out on to the piste, with stone tiling, extends the whole length of the property. Seating for 4 to 6 people for outside dining. - There are 8 sleeping places in the apartments but if you want to spend time comfortably there should be no more than 3-4 people because the whole space is ~30m2 including balcony. - No raclette machine. You can take it in sherpa shop. It was a proper and nice studio. The bed in the living room was a bit narrow and not totally flat. Good bathroom with enough hot water. Wifi is top class! Evening and after noon sun is just at the other side of the complex. Thank you for your candid feedback and we are very glad that you enjoyed your stay at our ski apartment 11 Praz in Vallandry. The high speed wifi internet that we provide free of charge (that you described as top class) is always a highly appreciated by all of our guests. Excellent accueil. Appartement très agréable par son équipement et la disposition de ces pièces. Point négatif : sol froid. Très bon accueil . Très bel appart répondant à nos attentes . Appartement très bien placé dans la station permettant un retour ski aux pieds ! Appartement très bien situé et très fonctionnel. Le propriétaire très sympa. Très content que vous avez trouvé notre appartement bien situé au pied des pistes de ski pour vos vacances scolaires en famille et à bientôt à Peisey Vallandry. Ski-in ski-out location, situated on the piste in Vallandry (Les Arcs) 150m from the nearest chairlift giving access to the huge and high Paradiski area with 425km of piste. 100m from the local ski school and crèche right in the resort centre with access to numerous bars, restaurants and shops.